Spring is one of my favorite times of the year! Mud and dirt, butterflies and birds – there is so much to see, so much to do, and so much to learn about! 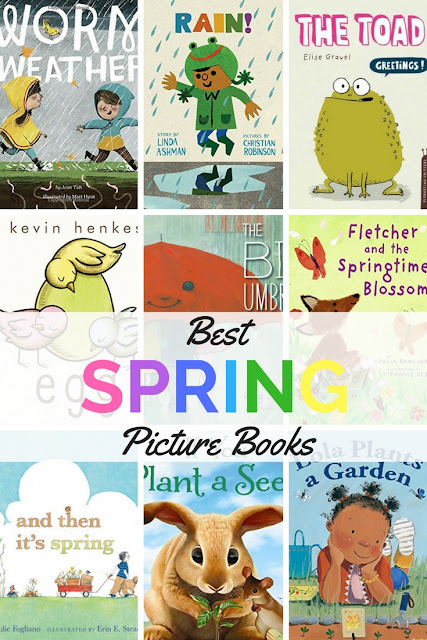 These books offer a great entry point to start exploring the fun spring has to offer! Do you need some fun spring literacy activities? 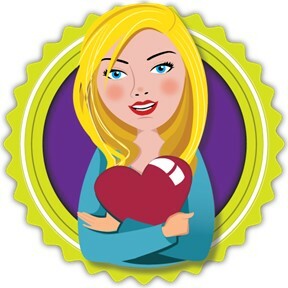 Check out my Spring Activities Pack! It’s filled with engaging literacy tasks like acrostic poems, alphabetical order, Go-Fish, word scrambles, word searches, a crossword puzzle, comparing and contrasting, sequencing events, and more! 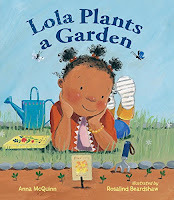 Inspired by a collection of garden poems, Lola wants to start her own garden. Lola and her mom go to the library to find books about gardening, buy seeds, dig, plant, and wait. Waiting for her flowers to grow is difficult, but well worth it. Once her flowers bloom, Lola invites her friends over food, fun, and a story next to her flowers. There are four eggs: blue, pink, yellow, and green. Three of the eggs hatch, but the green one doesn’t. The three new baby birds try to figure out the mystery of this green egg. What is it? There is an umbrella by the door, and it is big and friendly. 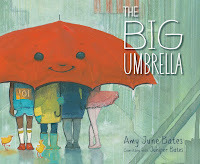 It doesn’t matter how tall or hairy or how many legs you have, there is room under this umbrella for everyone! 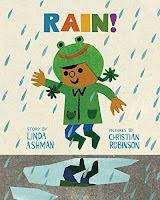 A great rain-related story about inclusion. The Toad is a funny nonfiction book with great illustrations. Kids will laugh and learn a lot about toads. It’s a great companion to learning about the life cycle. 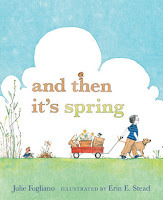 And Then It’s Spring is another garden-inspired book. After a long, snowy winter, a boy and his dog decide it’s time to plant a garden. After digging and planting, they wait and wait and wait for a sign that spring may finally be coming. 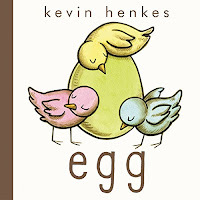 Simple text and fun pictures drive this rainy-day filled book. 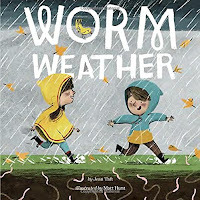 As kids splash and play in the rain, a worm also has fun squirming around in the rainy weather. 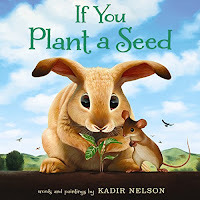 With minimal text and amazing pictures, If You Plant a Seed illustrates literal planting and growing as well as the power of planting seeds of kindness and what they grow into. On a rainy day in the city one boy’s excitement about the rain is only matched by one old man’s grumpiness about it. Can the boy’s enthusiasm brighten the old man’s day? A good book to teach perspective and to show that people respond to the same situation in different ways. Fletcher loves spring! From the birds singing, to the flowers opening, to chasing butterflies – what’s not to love? Well there is one unexpected thing not to love. Snow! 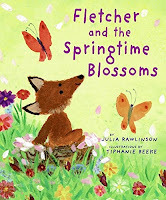 Spring is full of surprises as Fletcher finds out. 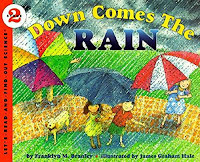 Down Comes the Rain is a fun way to learn about the water cycle. After the rain falls, the sun comes out, dries the puddles, but that water isn’t gone. It will come back again in the form of new clouds! Spring Picture Prompts – Students create their own short stories based on fun spring pictures. Rainbow Words CompoundWord Game – Students match up rainbow puzzle pieces to build compound words! Raindrop Word Families – Students search through raindrops to match raindrop words to their word family base and then practice writing their raindrop words on their recording sheet. nice list - thanks for sharing. This is handy.